Despite CEO Jeff Bezos’s political battles with President-elect Donald Trump, Amazon is going all-in by pledging to hire 100,000 U.S. employees with full benefits to launch its fully-automated grocery markets, which are expected to offer drone delivery services. Amazon.com (OTC: AMZN) currently has about 180,000 full-time employees in the United States and over 306,000 full and part-time employees worldwide. That represents about a 33 percent increase over the 230,800 at the end of 2015. With 600 percent employment growth in the last 5 years, Amazon’s employee base is now 3 times Microsoft’s direct workforce and over 4 times Google parent Alphabet’s 70,000 employees. Unlike other tech companies that are automating away employment or replacing Americans with H1-B foreigners, Amazon is accelerating hiring. Most of Amazon’s U.S. growth has been at its 18 “Fulfilment by Amazon” service centers. Although the centers open with part-time employees, Amazon’s CFO Brian Olsavsky recently stated that due to expansion factors, the company is converting more temporary employees to full-time positions. The next big phase for Amazon’s growth will be the roll-out of 1,800 square-foot “Amazon Go” grocery stores, which will feature clerkless shopping. The company opened its pilot store at one of Amazon’s downtown Seattle headquarters buildings. Food options include fresh produce, frozen foods, packaged grocery and prepared food options. Only Amazon full-time “blue badge” staffers can enter right now, but ARS Technica reported that the app-specific brick-and-mortar stores will be soon be open to Amazon Prime members who download a smartphone app. Through a combination of cameras and sensors powered by machine learning to track users’ activity, Amazon Go users can self-shop and their account will br billed as they walk out of the store. With a huge inventory of newly-built mixed-use apartments with vacant ground floor retail space dotting most major cities, Amazon Go will have no problem rolling out their concept nationally. In a move apparently timed to the public launch of Go, Amazon filed a Federal Communications Commission application for a Special Temporary Authority permit to use of an indoor and outdoor wireless communications system in Seattle and rural Washington. The application states: “Amazon seeks FCC experimental authority to evaluate prototype equipment and associated software designed to support innovative communications capabilities and functionalities.” It is signed by former NASA astronaut Neil Woodward, who manages of flight test and certification for Amazon Prime Air. Amazon’s application also “seeks to collect sufficient data within that time frame to assess the performance and reliability characteristics of prototype equipment and software to determine if additional research is needed and should be scheduled.” Rumors in the tech world suggest the system will support Amazon Go drone deliveries. 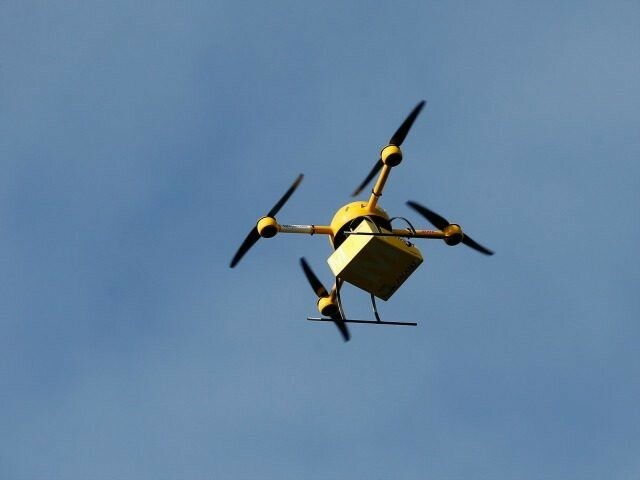 Amazon has already started making its first drone package deliveries in the UK, but Federal Aviation Administration regulations have limited the tech giant’s ability to conduct tests in its home market. Amazon patents applications include a “collective UAV” that would combine a flock of drones to pick up and deliver heavier items.